Ask an average fisherman about electric fishing reels, and you are likely to be met with either a blank stare, or a laugh. This is because fishing as a sport, has not changed very much over the years. We still use the same kinds of equipment, and the same basic fishing methods. So to most people, the idea of electric fishing reels sounds a little absurd. As most sport fishermen know, winding in that big old Penn multiplier 10 to 20 times a day is tedious at best. When sport fishing in challenging locations, the length of line that is trolling behind the boat can be very long indeed. Add to this the fact that if you hook a fish that makes a run towards the boat, then you need to reel in the slack line as quickly as possible, and we have a recipe for having to furiously crank a reel just to keep up with a charging fish. Electric fishing reels can help with this. This is pretty much an entry level electric reel for sports fishing. It’s not going to be able to handle any 1,000lb marlin, but its fine for sport fishing venues where exceptionally large fish are not expected. That being said, this is still a very nice piece of fishing tackle. Shimano is renowned for quality, and is second only the Penn when it comes to sport fishing and reputation. It comes equipped with a digital display that shows the length of line paid out, it also allows the user to switch between different fishing modes, such as bottom fishing or trolling. If you want a lower priced, yet good performance electric reel for sport fishing, then this is a good starting point. The big brother to the previous reel we looked at, this is a sub $1,200 electric reel from Shimano that is simply too good to overlook. It uses several Shimano patented features such as the Heat Free System, to deliver a fishing experience that is all about power and performance. The Gigamax motor can be run off either 12v or 24v power, and it comes with an adapter lead. Shimano state that this reel is three times more durable than similar reels manufactured by their competitors. We believe them. One phrase that springs to mind here, is “over manufactured”, you cannot fault the build quality of this electric fishing reel from Shimano. Whilst not intended for the full on, high performance electric reel market as the two Shimano reels we looked at above. This is nevertheless, a very functional electric reel for offshore use, and priced at under $600 it’s pretty inexpensive too. What we like about this reel is actually twofold. Firstly, we love the fact that all of the electronics are house in a single, watertight sealed package. There is absolutely no way that damaging sea water is going to get in to the motor. Secondly, it’s also been designed to be a very capable kite fishing reel. Finding a good kite fishing reel is a challenge, especially at a lower price, but this reel from Daiwa does the job. First off, let’s start by saying that for a spinning reel, the price tag of the Beast Master from Shimano, at just over $800, is pretty high. Sure, it’s a heavyweight spinning reel, and sure, it is electric, with all that entails, such as the useful display showing line runout etc. But it’s still expensive, so why have we included it? We have included it, because when it comes to electric fishing reels for spinning, this is the one, this is top dog, numero uno, and you won’t need to buy any other for heavyweight spinning. Check one out at a local dealer if you don’t believe us. This is one of the best spinning reels ever made, electric or non-electric. Let us just start by saying that we love this electric spinning reel. For light to medium spinning, at just $340 this is a bargain electric reel. It comes with Daiwa’s legendary build quality and attention to detail. It’s a good looking reel, and it’s a pleasure to use. With a drag power of up to 8kg, this is actually a pretty powerful spinning reel, and if you take care, you might even get away with using it for light offshore work. It’s also very light, less than 1kg which is great for this kind of reel. 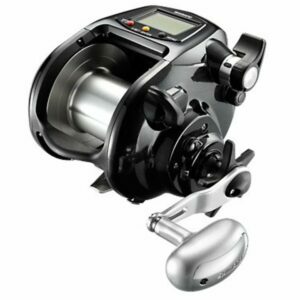 Overall, we recommend this reel highly unless you absolutely must have Shimano build quality. This is the baby of the Force Master range of reels from Shimano. It’s a great spinning reel for medium to heavy freshwater spinning and light to medium offshore spinning. This makes it the most versatile of all the electric fishing reels we have taken a look at so far. Although we really like the small Daiwa we showcased above, for an extra $100, we feel that the Force Master 400 from Shimano is the reel to go for. The electric motor is powerful, and the reel is entirely capable without the motor being used, so it becomes even more versatile due to this. Conclusion & Pick of the Bunch! 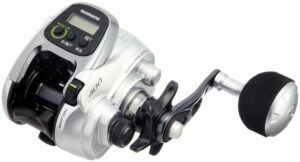 So, from all of the electric fishing reels we have taken a look at in this post, we are going to say that the best of the bunch, for sheer versatility, price, build quality and usefulness, is the Shimano Force Master 400. Sure, it might not be fair comparing it to the big sport fishing reels we looked at, but for overall value it is very hard to beat this offering from Shimano. What are pro/cons of using an electric fishing reel fishing for tile fish or a black bass and a minimum of 200 feet of water. Also what brand or type would you recommend. 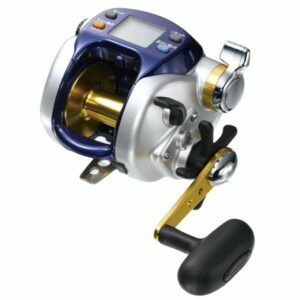 There are quite a number of electric reels now on the market and your mention of Shimano and Daiwa are of course popular models. I note that Miya Epoch with their Command range of Electric reels are omitted. They are fairly popular here in Malaysia and whilst I do not have one, I've friends who have and they are quite happy with it. I've used previously the Ryobi (mediocre), Daiwa Tanacom Bull 750 (good) and now the Shimano Beastmaster 9000. (excellent). I rate this reel as the best electric reel presently on sale. 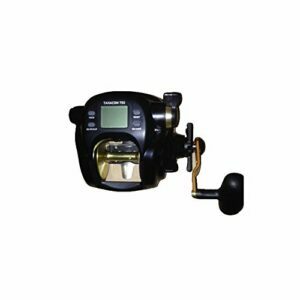 (The Shimano Forcemaster 9000,is a cheaper version0. One can't go far wrong with the Beastmaster 9000. It's a damn good reel. I would kindly agree with you comment on Electric Reels For Sport Fishing. There used to be a lot of negative comments made in relation to the use of electric reels in sport fishing. remarks like, "not sporting, not fair,takes the fun out of fishing," etc. etc. And at one time I admit, I did think like that too. Now some years later, albeit a bit older, i have changed my views drastically.! Fishing or Angling is a Hobby to most of us and the idea is to have Fun in this hobby. All Anglers would have in their arsenal of fishing gear various models of Manual reels (ie.non Electric Reels.) And we have loads of fun with them. And now with the advent of technology,we have Electric Reels.! And still have loads of fun.! Only more so.! If your'e into shallow water fishing,then i might say that electric reels might not be ideal,however if your'e ever into deep water fishing ie. in depths of over 100 meters, an electric reel is a godsend.!! Ive fished at depths of over 300 meters,with a Manual Reel and I can safely say that cranking up line at that depth with a 2 to 3 kilo sinker, just to check or renew bait, which is often,is no longer fun, it becomes a torture.! For those that need the workout,the electric reel is still ok. The electric reel is similar in most respects to a manual reel. So all one needs to do is just not press the rewind button,just manually crank it up.! On an electric reel,on hookup of a fish,manually crank it up. On checking bait,hit the rewind button.! There are other positive points raised in respect of the use of electric reels, which can briefly be summarized as,caters to the elderly or infirmed or those that are physically challenged. Young people and Women may find the sport more exciting. In any event one just cannot stop Technology, it's here to stay. Our gang of diehard Anglers are now all armed with an array of both Manual and Electric Reels on our deep sea forays.